Whats in Name - Ani answers! It is widely believed and accepted in general and within the community in particular, that the land of Sindh and its name, undoubtedly has a huge bearing on the name of our country. Well, it is said, “From Sindh came Hind, from Sindhu came Hindu.” Accordingly I believe, it’s a matter of great pride for every Sindhi Indian, to know that he belongs to a community that has not only been the genesis of the name for their motherland, but also the genesis of the name of the most practiced religion in the country. Quite a few youngsters of the community who have been born and bred in places apart from Sindh, and have not been fortunate to visit their homeland, repeatedly raise questions such as, “What is our culture? What is our History? What is the true script of our language?” – and with a certain sense of innocence state, “Are we only identified by our surnames? If one has an ‘ANI’ in his name, is he only then a Sindhi.” Most of these questions have simple answers. The community needs to be optimistic because the youngsters are now showing interest in furthering their limited knowledge about their glorious past. Thought, the sings seen show no meteoric rise in interest, the questions have started pouring. The remarks made by the younger generation on whether their surnames remain their only form of identity, may not necessarily be true. The community’s identity would revolve around their golden culture and their great civilization. But in the current struggle for reviving the Sindhi culture, the fact that the community is blessed with distinguishable surnames, could only further contribute in assisting the revival process. While trying to draw the genesis of surnames of any community, one has to bear in mind their ancient heritage, the background of their ancestors and their cultural / religious affinities. SINDHISHAAN took a peep down the pages of history, and made an attempt to understand the ‘why’ and ‘how’ of the evolution of Sindhi surnames. It seems in those early days in pre-historic Sindh, apart from the individual name (Nalo), each family was allotted a Nukh, which helped to identify one another. (Nukh was initially meant to be one’s Caste Name) The need for the same arose because, as the size of the families grew, it was imperative to identify each family by a name. The Aryans propagated families of one Nukh to live together under one roof. This was called ‘Kul’ or ‘Parivar’ and they were identified by their Nukh. If the settlement had more than one Kul or Parivar, it was called ‘Gotra’, meaning Larger or Maha Kul. The word Gotra is derived from ‘Go’, which means cow and ‘Tra’, which means shelter. Thus from one’s Nukh, one knew which Gotra one belonged to. As the size of families grew within the Gotra, need arose to identify each family by name. In Sanskrit, the word ‘Nukh’ is ‘Lakh’, or ‘Lakshan’, meaning ‘to know from where one hails.’ It is even pointed out that when the population of the Gotra increased, it was called Goth (village). Consequently, a glance down the History of Hindus reveals that during the Rig Veda period, each family was identified by their Grandfather’s name. Citing an example, the children of Rishi Garg were called ‘Gargeen’, while Dikash (Prajpati’s children) were initially addressed as ‘Dakshyan’ or ‘Dakshyani’. Studies reveal that ‘Yani’ or ‘Yan’ (Suffix) are Sanskrit words, which mean – ‘descendants’ and the same were pronounced in Sindhi as ‘ANI’. Another explanation of the same states that the word ‘Ani’ has its origin in Sanskrit word ‘Ansh’ meaning progeny or part of the whole. 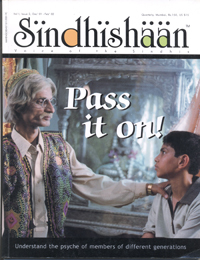 Generally, Sindhis add a suffix ‘Ani’ after the name of their great grandfather and that becomes their Surname. Shri Berumal Meherchand Advani in his book ‘Sindhi Hindu ji Tareek – History of Hindus in Sindh’ cites the example, the Sindhi surname ‘Gidwani’ originates from the name of Diwan Gidumal, who was the son of Diwan Belamal, who was the son of Diwan Choitram, who was the sone of Diwan Adiyomal. The author further points out a very interesting observation that though Diwan Gidumal himself had no children, his brother’s children used his name as their surname, as he was a highly respected individual in the society. Thus, Diwan Gidumal’s brother’s children and their subsequent generation used Gidwani as their surname, emphasizing the fact that they are the descendants of Diwan Gidumal. Dr. Baldev Matlani, currently Reader and former Head of Sindhi Department – University of Mumbai however states, “Though it is said that all Sindhis with the Surname Gidwani are descendants of Gidumal, they don’t necessarily have to be related because at any one given point of time there could have been more than one Gidumal, even though all his future generations would have the family name Gidwani.” The writer further states in his book that the ‘Advani’ surname has originated from the name of Diwan Adumal. Similarly, the surname Ramchandani belongs to the Sindhis who are the descendants of Ramchand while the surname Shewakramani belongs to the descendants of Shewakram, and so on and so forth. Berumal Meherchand makes another interesting observation that the surnames Ajwani, Bhavanani, Jagtiani Karnamlani and the Motwani of Sukkur all belong to the same family, though he has no reasoning for the same. Speaking on the subject of Sindhi surnames, Dr. Baldev Matlani says, “History reveals, in the ancient days, since the Vedic period until 712 AD, Sindh had only Hindu inhabitants. Subsequently, as a result of the many Arab invasions there were mass religious conversions and people adopted Islam. The Hindus who lived in Sindh in those days either converted to Islam, or having refused to accept Islam were compelled by the then rulers to pay heavy taxes. Many, in the effort to protect their religion left Sindh and settled in places such as Aror and Punjab. But the interesting part remains, that even those Sindhis who became Muslims, continued with their earlier surnames, and thus you can find Sindhi surnames ending in ANI even amongst Sindhi Muslims, such as Lakhani, Shahani (descendants of Shah Mohammad), etc. Some of the Gujrati Hindus and Gujrati Muslims too have adopted the practice of adding the suffix ‘ani’ to the name of their grandfather as their surnames. A well-known example of the same is Dhirubhai Ambani of Reliance Industries. Thus one could deduce that Sindhis adopted the practice of adding the suffix ‘ani’ to their grandfather’s name and came up with their surname. Certain Sindhi Hindus, such as the Ajmanis of Punjab, Jumanis of Sindh who are originally from Punjab, or Butani, Bhatyani, Bhagtani, Gursiani, Haryani etc. are examples of surnames which have evolved by adding the suffix ‘Ani’ to their castes. While trying to further look at the genesis of non ‘ani’ Sindhi surnames, it will certainly help if one tries to understand the evolution of few other common Indian surnames. Similar to the English, many Indian communities who were involved in their traditional business have lent their names to the words denoting their occupation, and later, these became surnames or family names. Certain communities also began the practice of adding a suffix to the region they belong to, as their surname. An example of this practice would be, in the Maharashtrian surname Nimedhkar by those who belonged to the region of Nimedh, while another example would be in the Parsi surname Khambata. On the other hand in the Northern parts of India, certain communities had not adopted the English-style surname system. They adopted the practice of simply having their caste names tagged after their surnames. This style of having one’s community-caste name as the family name is a practice that is predominant in the North, and also found in some parts of the South. So, Gupta-Sharma-Patel-Mishra, etc. which are certain North Indian names while Iyer-Nayudu-Iyengar etc. are certain South Indian names which are all primarily caste names. Likewise, the practice of adopting caste based surnames or region based surnames was also prevalent amongst the Sindhi community. The people who are from the Arorvansi caste are those whose forefathers hailed from Aror. In the days of Emperor of the Rai and Brahman dynasty, Aror was the capital of Sindh, though Aror is currently only a small village near Rohri – Sukkur with only ruins existing. There are approximately 458 sub-castes of the Arorvansi race. A few of them have also evolved as surnames, such as, Hinduja, Makhija, Dhameja, Valecha etc. There are also a few castes of Sindhi Muslims living in Sindh, such as Juneja, Chuneja, Deepanja, Sidhuja, Nareja, etc. who also seem to be originally Sindhi Hindus from the Arorvansi race. A few other sub-castes of the Arorvansi race have adopted their surnames over their caste names, such as, Bajaj, Ahuja, Sachdev, Nagdev, Vashdev or Manchanda. Sindhis who belong to the Brahman caste have surnames such as Sharma, Jetley, etc. Similarly, the people residing in Nasrapur (Birthplace of Jhulelal) have adopted the surname Nasrapuri, whereas a few Sindhis who had the origin in the region of Kucch, have surnames such as Kucchi, or the ones who lived in Mirpur are known as Mirpuri. Similarly, the Bhatias, which is a caste as well as a surname were initially the Bhatti Rajputs of Jaisalmer who resided in the land of Sindh. Dr. Baldev Matlani, when quizzed on why few Sindhi surnames are common with those of other communities, says, “As, mentioned earlier, Sindh was initially inhabited only by Hindus, but during the Arab invasions and the mass conversions that followed, many Sindhi Hindus fled Sindh and settled in the areas to the South of Sindh, Some of these Sindhis returned back to their homeland, while few others settled back in these regions. The Sindhis who settled there adopted the practices of that region, and their future generations lived as inhabitants of these newly adopted regions. Hence, you find Bhatias in Sindh as well as in Punjabis. There are also a few other castes which end with the suffix ‘pal’ such as Rajpal, Khatpal, Khatrapal, Nangpal, Nagpal which are also used as surnames. There are also certain other Sindhi surnames such as Thakral or Munjal, which seem to be a reduced version of the suffix ‘pal’ though no necessary reason could be attributed for the same. Voila, that was about the various Sindhi surnames and a little bit about their genesis. Though we may not have been able to write about all the different forms of surnames that exist within the community, one thing is for sure, the surname in its true form itself is an indicator of one’s cultural background. Unfortunately, a few of our age-old surnames are witnessing a decline in size. Shortening of surnames seems to be getting considered as hep and in vogue. Without mentioning the surnames that are getting shortened by the day, we only want to use this opportunity to inform those members that the world comprehends their move in a different light. It seems to indicate that they are not proud of their ancestral roots and aren’t very keen in maintaining their Sindhi identity. At a time when the community is battling for cultural survival, the need of the hour is for all community members to feel proud of their surnames and ensure they be used at every given opportunity in their fullest form. If the youngsters realise that there is a lot of history attached to the very origin of their surnames, it won’t be difficult for them to comprehend the fact that they belong to a culturally rich commune.